Bridge City Volunteer Fire Company No.1 is part of the 7th District located on the Jefferson Parish West (Best) Bank. Now for you out of towners who happen upon this site, Jefferson Parish is divided by the mighty Mississippi River. The town of Bridge City gets its name from the Huey P. Long Bridge, that lands on the West Bank in our community. The Huey P. Long Bridge is the longest railroad bridge in the world. Other departments in the 7th District include Avondale, 9 Mile Point, Herbert Wallace and Live Oak. 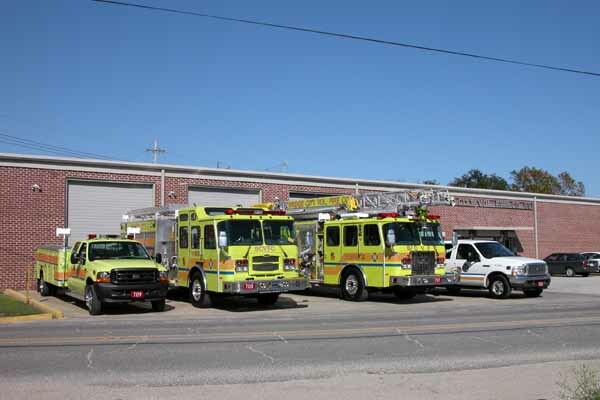 Bridge City has only one fire station and is located on the west end of Bridge City, LA, where Louisiana highway LA-18 meets Bridge City Ave and adjacent to the downriver end of Northrop Grumman Ship Yard. The fire station includes; three double engine bays, crew quarters and a meeting hall used for training, testing and community activities and meetings. The station also has a cascade system used for filling SCBA bottles for the department and other departments in the district. The Jefferson Parish Fire Training Center is also located in Bridge City, practically under the Huey P. Long Bridge. In case you missed a night of good entertainment well I am sure "Oldskool" Wrestling will return soon. Keep checking here for future dates and times. A great time was had by all in attendance. Call 329-4279 for tickets or information on future events. "Oldskool Wrestling" is a fundraiser for the BCVFC. Jerry Sires, a volunteer firefighter with the BCVFC, is on assignment in Kuwait. He is also the temporary webmaster for this site so if you have news to post please get in touch with me at (sires9094@yahoo.com). The Bridge city Vol. Fire Co. would like to thank Operator/Shift Captain Keith Bergeron for his dedicated years of service. Keith has been a paid employee with the fire co. for over 11 years. He will be moving on and furthering his career at the naval air station fire dept in Belle Chase. Wish him well! © 2007 Tom Sires. All rights reserved.